Zebra Technologies deploys Oracle Value Chain Execution, increases efficiency, visibility, and revenue. Zebra Technologies chose to partner with Gaea for their worldwide rollout of Oracle VCE. 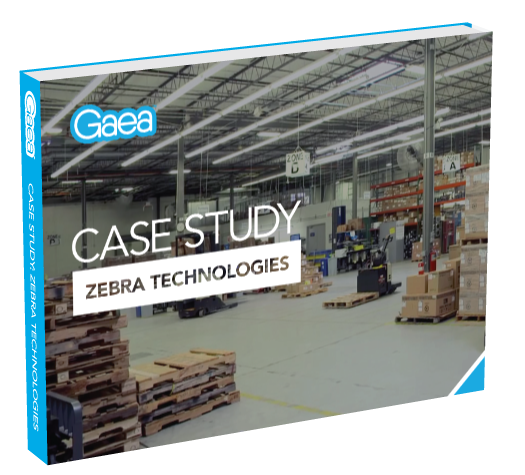 Gaea helped Zebra improve their manufacturing process, optimize their warehouse operations, and increase throughput efficiency. “Benefits we have received through this real-time location solution have been phenomenal,” says Kroft. “The pickers are more quickly able to consolidate picks in our staging area, and we’ve actually done internal studies that show we’ve had a 40% space savings in our staging location. We were already a space-constrained environment here so that’s been huge for our WM team, to be able to get more throughput without actually having to expand the footprint of our warehouse.” “It’s the best it’s ever been,” adds Gary Meekma, Zebra’s Sr Manager of Warehouse Ops. To learn how Gaea helped Zebra achieve this ROI, download the full case study. In the video below Kirk Kroft and Gary Meekma discuss how Gaea exceeded their expectations.